ECR4KIDS Colorful Donut Cushions Set ECR12697 $305.13 Colorful Donut Cushions provide a comfortable alternative to sitting on the floor. Made of cozy and durable 2 thick foam, children can carry the lightweight cushions to their favorite place for circle time or story time. Attractive round cushions come in two tone primary and secondary colors to brighten up any home, daycare or classroom environment. 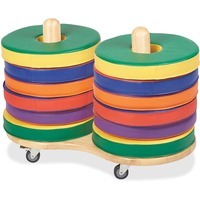 This set also includes the durable hardwood Small Donut Cushion Cart to keep up to 12 donut cushions organized, off the floor, and stored neatly away. The cart features rounded edges for safety and includes four convenient casters making it easy to move the rack for storytime or store them neatly away when playtime is over. Donut cushions are designed for children ages 2 and up.